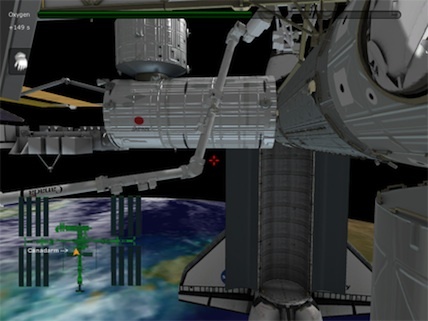 The Station Spacewalk Game allows you to take on the role of an Astronaut tasked with completing several missions around the International Space Station. The majority of the missions take place outside of the Station. Freedom of movement in space is granted to you by your Simplified Aid For EVA Rescue (SAFER) unit, a propulsive backpack system. You have a limited supply of oxygen that you must be careful to conserve. Each mission has a number of objectives that you must complete. As you play through the missions you recieve some guidance from Mission Control. You are scored at the end of a mission based on time, oxygen remaining, and objectives completed. "Houston and Alpha from Discovery, the fly-out looks good and we're initiating the final approach from 30 feet." "Discovery, Houston copies. Initiating final approach." "Houston and Alpha, capture confirmed." "Discovery, Houston. On the big loop, station free drift confirmed." "And on the big loop Alpha sees we're in free drift also. Welcome to the Space Station, Discovery. We're glad you're here." Overlaid on the screen are interface elements that direct you to enter a name, which is used to track statistics such as which missions have been completed, how many points have been earned, and how much time has been spent in space so far. When a name is entered, the interface elements show your player statistics and allow you to select a mission to play. There are seven missions in the Station Spacewalk Game. Spacewalk 1: Explore the Space Station. The first mission begins in the Quest Joint Airlock. A voice from Mission Control explains that your mission is simply to explore the Space Station. You have unlimited time and oxygen with which to fly around to the different nodes of the International Space Station and read their descriptions. The mission is complete when you return to the airlock. Spacewalk 2: Retrieve Your Tools! The second spacewalk begins in the Quest Joint Airlock. The first task is to exit the Quest airlock and use the SAFER Unit to move through space. As you move around the exterior of the International Space Station, your task is to locate and gather as many of the loose items scattered around the station as possible and return to the Quest Joint Airlock without running out of oxygen. The items you can gather include a pistol grip tool, a wrench, a ratchet, a hammer, a grease gun, a helmet, a tether, a multimeter, a communication tool, and an infrared camera. Spacewalk 3: Unfurl the S6 Solar Array. The third spacewalk begins in the Quest Joint Airlock. The first task is to exit the Quest airlock and use the SAFER Unit to move through space. As you move around the exterior of the International Space Station, your task is to find the end of the S6 truss where you will find the retracted S6 solar panels. The second task is to remove the blue restraint straps securing the two retracted solar panels on the S6 truss. After removing each restraint strap, the solar panel will begin to unfurl. Spacewalk 4: Repair the Torn Solar Array. The fourth spacewalk also begins in the Quest Joint Airlock. The first task is to exit the Quest airlock and use the SAFER Unit to move through space. As you move around the exterior of the International Space Station, your task is to locate the end of the Canadarm2 and attach to it. The Canadarm2 will move you to the repair spot over the torn solar panel and then release you. The second task is to attach two "cuff link" repair tools to the damaged section of the solar panel. You will need to attach one cuff link to each side of the tear. The third task is to tighten the ropes between the cuff links to repair the solar panel. Spacewalk 5: Bring the Auxiliary Antenna Online. The fifth spacewalk begins in the Quest Joint Airlock. Communications with the ground have been cut off. Your goal is to bring communications back online. The first objective is to head out of the airlock and locate a small auxiliary antenna, attached to the Japanese Experiment Module. Once you've reached the antenna you must use your multimeter tool to supply the correct voltage from the nearby switchbox to the antenna. Finally, once the antenna is powered on, you must verify that communications have been restored by using your handheld communicator tool. Spacewalk 6: Install the S6 Truss. The sixth spacewalk begins inside the Quest Joint Airlock. The first task is to exit the Quest airlock and use the SAFER Unit to move through space. As you move around the exterior of the International Space Station, your task is to find the end of the S5 truss. The S6 truss is being held by the Canadarm2 robotic arm and will be moved into position. As you near the S5 truss, the Canadarm2 begins to move the S6 truss and align it with the S5 truss. The second task is to verify the alignment and distance between the S5 truss and the S6 truss. The laser measurement tool is used to measure the gap between S5 and S6 in two places. After the measurement, the Canadarm2 slowly moves truss S6 to contact truss S5. The third task is to use the Pistol Grip Tool to install 4 large bolts to secure truss S5 to truss S6. Once the S6 truss is secured, the Canadarm2 will release the S6 truss and retract. Experiment 7: Conduct the SPHERES Experiment. The seventh mission of the Station Spacewalk Game involves conducting a simple experiment with the Synchronized Position Hold, Engage, Reorient, Experimental Satellites (SPHERES). First you will run a diagnostic test suite on the SPHERES that will familiarize you with movement and handling of the satellites. Next, you must perform the experiment itself, which involves navigating one of the satellites through a course of floating rings inside the U.S. Destiny Laboratory.